Not the same old award year after year! We value the award process and when a student is recognized two years in a row, we don't think it should be a duplicate. 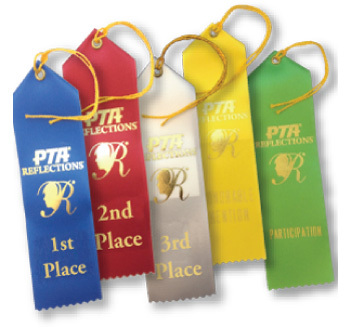 Our PTA Reflections Awards changes each year on most theme on the certificates, medallions and trophies. 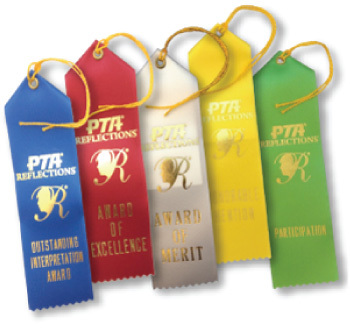 In addition, all of our awards are remarkably value priced to fit the slimmest of budgets. We offer certificates as low as $0.40 each and trophies for $5.00 each. Truly a win for the students and your PTA! 8.5" by 11" - full color paper certificate with 2018-19 / "HEROES AROUND ME" theme included. Location on certificate for you to fill in student name and art category. Large 2.5" real metal medallion inset with the 2018-2019 Theme design "HEROES AROUND ME". Each medallion comes with a maroon PTA Reflections logo neckband. 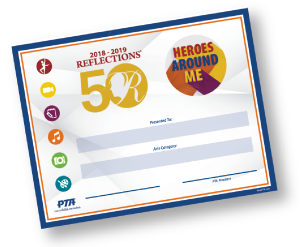 Each trophy option has the 2018-2019 Reflections theme "HEROES AROUND ME" design inset on top. At time of purchase, you select the Art Category and Award Level for each trophy.